We are engaged in manufacturing and supplying a broad assortment of Stardust & Wrought Iron Curtain Rods. Under the stringent observance of our quality experts, these are crafted using premium grade raw material. 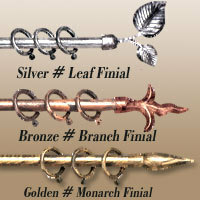 Available in very special king size finials, these are widely used in homes, restaurants, offices and hospitals. Ferro Range These rods are in 23 mm diameter. They come with specialised paint finishes in double tone. Finials are made of die cast aluminium in latest stylish designs to add touch of class to your interiors. - Rods Available in Stainless Steel Rods, Wooden Rods, Antique Finish Rods, "M"Track, Power Track Channels. 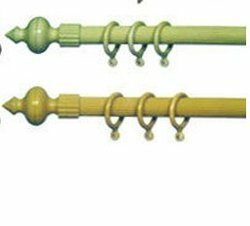 We offer an irresistible stardust fluted and wrought iron curtain rods which are offered with very special kingsize finials. Available at industry leading prices, our entire range is widely demanded in the market is one among the mass preferences.